A clean and beautifully crafted picnic table to make the most of al fresco dining in your own garden. If you're after an elegant outdoor furniture set for your garden, the Emily Table and two bench set will suit your garden perfectly. Expertly made from quality timber, the furniture set is practical, yet striking. The benches are designed to seat 4 to 6 people. Easy to put together, you'll receive all fixings and full instructions, so you can assemble it quickly and simply and start using your dining set in no time at all! Made from strong and study FSC wood, the furniture set is practical, yet striking. The benches are designed to seat 4 to 6 people. Easy to put together, you'll receive all fixings and full instructions, so you can assemble it quickly and simply and start using your table and bench in no time at all! 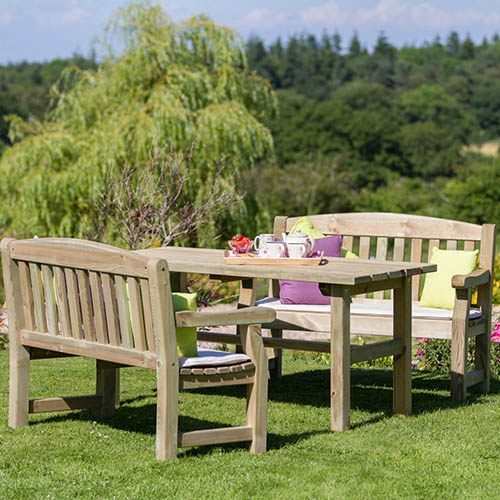 The Emily Table and 2 Bench Set is manufactured from high quality, pressure treated, FSC® Certified timber to last longer, and comes with 10-year guarantee against rot so you can be sure that this product will last and remain to be a beautiful feature in your garden. Dimensions: 1.60m x 2.06m x 0.945m, assembly required - This product is 2-person assembly.